The Committee on Local Economic and Social Development aims to contribute to the development of proposals and initiatives for collaboration and cooperation between local governments and associations in order to enrich the debate within UCLG and to participate in the elaboration of UCLG policy and its implementation in the area defined by the Executive Bureau and within the framework of the Operative Programme up to 2016. The focus of the actions of this Committee is on local economic development as a public necessity, that is, as part of public policy in local and national government agendas. This view of development implies a territorial focus, based on endogenous resources and obeying environmental sustainability criteria. In turn, this view of local development must be constructed through public participation, it must strengthen decentralisation and it must involve an integrated vision of the territory, through participatory territorial planning. There is no doubt that this new view addresses the challenge of social inclusion and gender equality. ­ Recognition and sharing of weaknesses, agreement on the obstacles and the development of strategies that will allow us not only to transfer positive experiences but also to learn together from the errors and successes of the past in order to agree frameworks for common action that will serve as a reference point for Local Development. Economic development is not an end in itself but one important means by which people strive to enhance their well-being. The task of economic development practitioners is to help to make this possible. This view of development has several important implications. Economic development is not only economic growth, important as that may be. To be developmental, it must be inclusive, providing supports and opportunities for those who are typically marginalized, particularly women, youth, indigenous people, ethnic minorities, and people with disabilities. Economic development must also be environmentally sustainable, ensuring that future generations have the same opportunities as those alive today. And economic development must be informed by cultural policies that enhance the capacity of people to assign meaning and purpose to their participation in the social and economic life of their community. LED is participative. 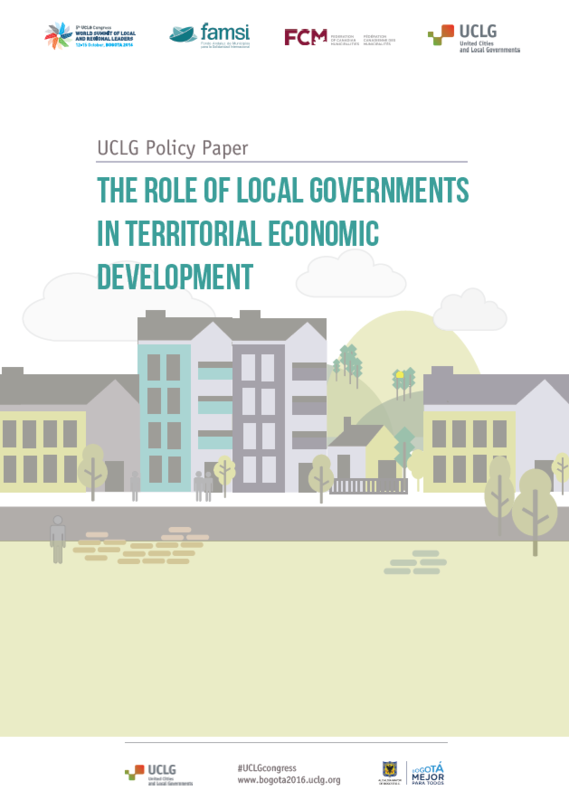 It is based on partnerships between local authorities, the private sector, other public sector agents, and civil society, to foster local commercial activity. This can take many forms, including social economy enterprises responding to the needs of marginalized groups, as well as micro, small, and medium enterprises (MSMEs). LED initiatives are community-led and locally owned. Local governments provide leadership and coordination in the planning and implementation of LED initiatives, either directly or through delegation to community-based agencies. LRGs build social capital, connecting local governments with their communities in a myriad of ways, generating innovative solutions to local needs. LED plans integrate efforts across sectors, developing both the formal and informal economy, with a view to realizing community goals, such as better quality jobs, reduced poverty, environmental sustainability, and the inclusion of marginalized groups, notably women, youth, people with disabilities, and indigenous peoples. LED initiatives vary widely, depending on local needs and conditions. They may include the development of infrastructure, research and innovation, skill training, attraction of new investment, technical and financial services to new and existing enterprises, supportive procurement policies, and support for marketing. LED is a long-term process, aimed at developing inclusive, resilient communities. LED practitioners recognize that it takes time to build local capacities and include marginalized groups. They therefore use a diverse variety of indicators to measure success.